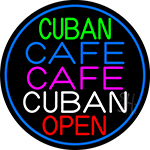 Reach out to your customers and pull them towards your establishment with the visual effect of Cuban coffee neon sign. Entice all to dig into your caf� and enjoy over Cuban espresso and conversations with the sight of Cuban coffee neon sign. 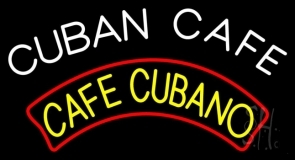 Give a unique d�cor to your coffee shop, roadside caf�, lavish restaurant or any bistro with the placement of Cuban with coffee cup neon sign. The shine and glow of Cuban neon sign exceeds the brightness of all other light forms and is clearly visible from a far distance. Extreme conditions have no negative upshot on the radiance of Cuban coffee neon sign. A Cuban with coffee cup neon sign is certain to glow up your coffee house with many upcoming years in addition to low maintenance cost and high durability. Cuban coffee neon signs designed in our collection are best in quality. We have a wide range of stock Cuban with coffee neon signs that are available in enormous options of colors, fonts, styles and dimensions. If you are looking for a Cuban coffee neon sign other than one from our collection, you can get your Cuban coffee neon sign personalized. Our proficient designing staff will design the exact replica of your custom Cuban coffee neon sign that will set to all your needs. You can also add animation with flashing borders and texts into your personalized Cuban coffee neon sign and add variance to establishment�s atmosphere. So add some action, uniqueness and comfort to the ambience of your coffee house with customized Cuban coffee neon sign and draw numbers of customers and huge profits to your business. Get your Cuban coffee neon sign today!